There is no doubt that design and construction are incredibly important when making a polymer clay cane. But equally important is the reduction process. You want to be able to reduce the diameter of the larger scale polymer clay design to a size that makes it easy to use and store. You could just squeeze the cane, but of course you also want to reduce the cane without very much distortion and wasted clay. For a round cane, you can squeeze and roll the cane to make it smaller. But what about a square cane? How do you make a square cane smaller without skewing the proportions and distorting the image? Here’s my trick for reducing square canes. You just need some basic supplies from the craft store. Instead of rolling a cane like a snake to reduce it, you have to reduce a square cane’s diameter without losing the square shape. Most people use an acrylic roller or brayer to roll down the length of the cane, trying to keep the roller level, to make the cane increase in length. You just roll down one face, then turn the cane to another side, then roll down that one. You just keep going…roll…flip…roll…flip…over and over. It takes a while, but eventually the cane is longer and narrower and a general square shape is maintained. The problem with this method is that your hands won’t roll evenly. One arm will roll harder and the roller won’t be level. It will eventually even out, and the cane will look square on the outside. But what will often happen is that inside of the cane will twist and skew, more and more with every swipe of the roller. Here’s an example of what that can look like. Note how the individual extruded subunits of this cane became distorted during reducing. The subunit in the lower left, in particular, has become elongated vertically, while the one in the lower right has become flattened. Reducing square canes is difficult to accomplish without distortion. A lot of people also use a flat sheet of acrylic or glass to push the sides of the cane flat, turning it after each press so that each side is perpendicular to the other. But this doesn’t solve the skewing issue shown above, and merely squares off a cane. Both of these methods make it difficult to reduce a square cane to be the same dimensions along its entire length. Years ago, I read of Jennifer Patterson’s cane-making tips on her Quilted in Clay website. I loved the way she used square acrylic rods to reduce square canes. It’s a simple way to reduce square canes by using square rods. Just place one rod on either side of the cane and roll along the top with an acrylic roller or brayer. The roller will gently push the clay down as it rolls along the length of your cane, compressing the cane to the height of the square rods. Turn your cane to the next face, and repeat. Hold the square rods against the cane so that as the pressure from the roller presses down, the cane moves lengthwise instead of expanding in width. Repeat until all sides of the cane are exactly the same height as the rods. You can then move to the next smaller set of rods, rolling the cane in the same way, reducing square canes to be the same height as the next set of rods. It also helps to pull and stretch the cane as you go, lifting it from the work surface so that the cane’s outsides aren’t slowed by being stuck to the table. Not all reduction has to come from rolling. Also, if any part of the cane is too low, just push the cane in from the ends a bit and make it bigger in that spot. 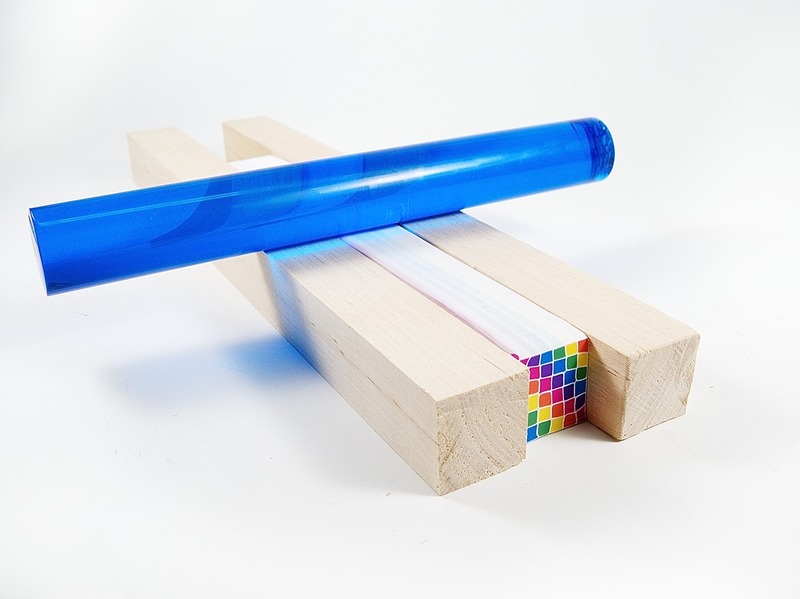 You will use your roller to flatten the cane to fit the rods and make the cane perfectly square. Jennifer does have a video that explains how to reduce large square canes. I think you’ll find it helpful. If you’re reducing a long cane like the one above, two rods are fine. But if you’re reducing a small short cane like this, the rods will wobble. It’s helpful to use a third rod in the “channel” between the rods. This keeps them parallel and acts as a better guide for a reducing a small piece of cane. The biggest advantage of this method is the way that you can reduce square canes with almost zero distortion. This is the method that Ed Street used to reduce his butterfly cane that he sent me in those really cool PVC pipe mailing tubes. But because the canes are reduced with very crisp and square corners and edges, this method is fantastic for making subunit canes such as the rainbow quilt cane you see above. If the subunits are perfectly square and equal sized, they will stack well and build a clean cane. You can even make a rectangular cane with this same method. Just use different sized rods for two of the sides. What if you want to make a cane that is larger than your largest rod? No problem, just stack the rods! This way you have much more versatility with this simple set of tools. If you prefer, you can use some masking tape on the rods to keep them from falling off each other. To make the square rods you see here, just use plain wooden dowels from the craft or hardware store. You can find dowels in many sizes. I bought six square dowels, each 36″ (1 meter) long. I did have to sort through the dowels at the store to find ones that were straight, unwarped, and didn’t have rough edges. I spent $11.25 for six dowels in sizes ranging from 1/4″ (6mm) to 1 inch (25mm). Once home, I cut them into 3 pieces each with my jeweler’s saw and finished the ends with my Dremel. I didn’t need to do it with these, but the sides could be smoothed with a bit of sandpaper. Since these rods will be in contact with polymer clay, and polymer clay can soften paint, I wanted to leave these unfinished. You might question the wisdom of using unfinished wood in contact with polymer clay. In general, the plasticizers and oils in polymer clay will leach into paper or wood that they touch. But we’re only using these rods as a guide while we’re rolling the clay. The clay isn’t in contact with the wood for more than a minute or two. If your clay sticks to the wood, try very lightly dusting the sides of your cane and wooden rods with some cornstarch (cornflour). Even so, I expect these pieces of wood will get a bit gunky over time, so give them a good scrubbing with a baby wipe from time to time. If you find that you’re using these wooden rods so much that you want a cleaner and more permanent solution, you can purchase square acrylic rods that work identically and can be cleaned more easily. Acrylic rods are an investment, which is why I opted for the more economical wooden dowel solution. But you can sometimes find acrylic rods for a good price if you have a plastic supply shop in your town. You can buy a set of the rods from Jennifer Patterson at Quilted in Clay. Another option is to get a set of Teresa Salgado’s SquarePairs. They’re a set of hollow square acrylic rods that she uses in her caning videos. However, her website says she is currently out of stock. Thank you, I’ve added the info to the article. Thank you for this information, Ginger. Keeping square canes squared up has always been a struggle. I’m definitely going to try your method. A trip to the hardware store is in the plans tomorrow! Thanks for another great idea, Ginger. I wonder, if you use wood dowels but don’t want to paint them, could they be wrapped in Contac Paper? That cleans off easily but I don’t know if it would react with the clay. Possibly, but I suspect the contact paper wouldn’t play nice with plasticizer over time, making the adhesive gummy. I don’t think there’s that much advantage in covering them, to be honest. You can watch Jennifer’s video to get a better idea of the process, here: http://www.quiltedinclay.com/polymer-clay-tools/polymer-clay-tutorials.htm. Yes, you’ll start with rods that are shorter than your cane, and roll it down to the level of the smaller blocks. Go slowly, bit by bit, not in one steamroller-like compression. Stretching by hand is a big part of this. As for the third rod, that’s just if you’re trying to reduce a short little piece of cane. It keeps the rods parallel as you roll. It’s not necessary, but it helps keep things in line for short pieces. Longer canes won’t need them. You’ll see what I mean when you do it. This seems like an excellent idea to keep the pattern as sharp as possible in a square cane. Usually a little bit of distortion doesn’t bother me, but with extruded patterns or quilt block type patterns, it really makes a difference. I watched the video and read through the details. From what I can tell, as long as the side “props” are of the right height and have a smooth top, it doesn’t really matter if they’re square dowels or rods does it? Couldn’t I use some hardciover books or something for example? Yes, in general. I actually used books before I bought the dowels. It works well for getting an even height. But I found that I do like to use the dowels to squeeze the cane from the sides as well. Not a lot, but enough to even it up and make the sides parallel as you’re going. Most of the reducing will be done by stretching and rolling, but the squeezing does have its place and books are going to be limited for that. That does make sense 🙂 Looks like I’m going to be buying some dowels. I need to figure out how to cut them though. I like to use pairs of knitting needles as height guides. I place the heads over the edge of the glass cutting board that I use as a work surface (so that I just have the knitting needle part on my work surface), and tape the ends down with masking tape. Because knitting needles come in so many graduated sizes, I can start with a bigger pair and work my way down to the size that I want. Also, if you are a garage sale stalker or have a friend who does, lots of times you can get fistfuls of knitting needles from someone whose mama doesn’t knit any more for cheap! That’s an excellent tip, Doreen. Thank you. I do like the crisp right angle edge that you get with the square dowels, but then I also love the idea of having so many size variations. I also have a ton of old metal knitting needles. I prefer to knit with circulars, so my old straights are just sitting there. Cheap acrylic frames (like these: https://www.amazon.com/8×10-Acrylic-BOX-Frame/dp/B01AAORHC4/ref=sr_1_5?ie=UTF8&qid=1530826535&sr=8-5&keywords=clear+acrylic+box+style+frame), which can normally be found very inexpensively at Walmart or the like might also work. They could, if they’re truly acrylic (aka PMMA). But beware that many of the clear “acrylic” items like this are actually styrene and will be permanently damaged by contact with polymer clay. Listings lie. I’ve been burned by this a few times when buying boxes and drawer sets that are labeled as acrylic. They weren’t. Good point — would they hurt the clay though? I was thinking that for the price I’ve seen these frames ($3each or less), they’d almost be something you could replace if they became damaged? Generally, acrylic is a fairly expensive material, so if you’ve seen frames this cheap they’re almost certainly made from styrene. Yes, it would damage the clay. Polymer clay dissolves styrene and will even fuse completely with the plastic. Certainly, feel free to give it a try. But I think you’ll find that wooden dowels are cheaper, easier, and more effective. Thank you for reference Ginger!! I would like to add a couple of points I learned over the years if you do a LOT of reducing using the wood it can cause the wood to compress so it is no longer square. This is more likely to happen if you are using a soft wood like Balsa than a hardwood like oak. The other thing I have had happen is when using the hollow tubes if you use to much pressure it can cause the tubes to crack and break. This is why I moved to the solid acrylic, which I have had a hard time finding for a reasonable price in the past few years.